Amazing things happen to metal when it is put in the hands of an artist and the artist also happens to be a welder. At Peninsula College, three welding students are channeling their technical and creative talents into breathtaking pieces of art and redefining welding as a career. Meet Mike Tade, Rachel Loomis and Eulalia Engel. Although still a first-year student in the Peninsula College Welding Program, Mike Tade of Sequim is already making a name for himself on the peninsula and beyond as an artist. Chances are you’ve seen his work if you have been to 7 Cedars Casino, Dockside Grill, Joyful Noise, Joses's Famous Salsa, Hardy's Market and Batson Enterprises in Sequim or the Heatherton Gallery in the Landing Mall in Port Angeles―beautiful renderings in burnished metal of leaping salmon, trout and other Pacific Northwest wildlife that capture the spirit of our landscape and the wildlife he’s honoring with his work. Mike recently started his own company, Burnishing Creativity, and hopes to make a living doing his metal sculptures, welding repairs and custom metal art, from signs to logos, when he finishes his Peninsula College AAS degree in welding. He’s already got a good start on realizing his goal: In just a few short months, he’s sold more than 50 pieces and is working on others that he plans to donate to the Sequim Senior Center for a silent auction they are having at the end of May. Although he is quickly becoming known for his evocative creations of salmon and trout, Mike says he also does a lot of other sculptures, ranging from music notes to birds, animals, landscapes and other sea life. “Salmon and trout are a big thing here in the Northwest so I thought I would make something that was tied to the area we live in,” he says. Although Mike had a lot of experience in drawing and painting, he did not sculpt metal until December 2013. 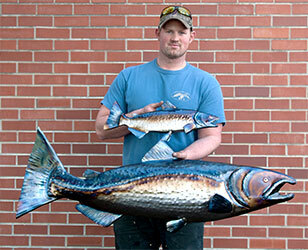 “I wanted to surprise my wife with a sculpture that she had told me about, so I made her a fish she wanted, a salmon made out of aluminum,” he says. And because he is a published artist in other mediums, Mike figured that when it came to metal he could teach himself how to shape and form it, and he has! 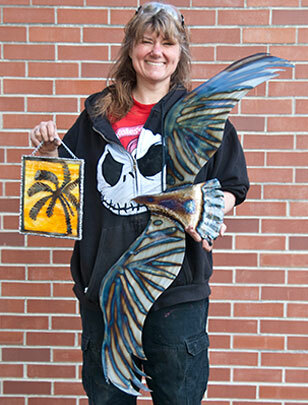 “Everything I do becomes an art form after some practice and a long learning curve,” says Rachel Loomis of Port Angeles when she talks about her welding. A nurse for 26 years, Rachael is now in the first year of her AAS degree. Although not a trained artist, Rachael is no stranger to the arts. She sews, quilts, does stained glass, draws, paints, beads, and works with wood. To her, metal is another learning opportunity, and the welding shop at Peninsula College is the perfect environment. “The atmosphere is very conducive to 'dabbling' in metal in the shop. Forging, fixing, torching, plasma cutting, sand blasting, annealing, casting, machining, and welding all occur alongside each other,” Rachael says. And perhaps best of all, the students help each other, both with private and shop projects. “It isn't hard to be creative in a supportive environment,” she adds. Rachael also works in glass. She now has seven in varying stages of completion, ranging in size from 8 x 11 inches to 22 x 24 inches. The works are an extension of her stained glass background, but focus on a metal overlay against a single sheet of glass. “The metal overlay is plasma cut and annealed to flatness and mounted,” she says. Although Eulalia has always been interested in art, she says she hadn’t really thought much about combining art and welding until she got in the welding shop and saw all the possibilities. 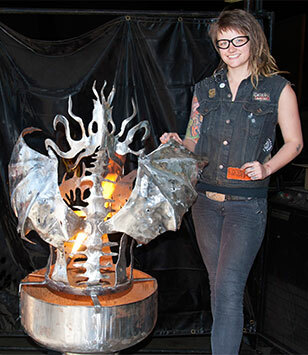 When someone commissioned the welding students to create a dragon, she was ready for the challenge. With no formal training in art, Eulalia says she just started working. “Metal has unique qualities that are resurrected when it has been heated and forged. It was these qualities that breathed life into this piece. I often felt when working on the fire pit that I was the tool the metal was using and not the other way around." Now that the dragon project is behind her, Eulalia is looking toward a future that will continue to combine welding and art. “Welding has helped me become better at everything,” she says. “It makes the brain click in a different way. I’ve developed better hand-and-eye coordination, and it has even helped me in my music as I listen to the frequency and timing of the machines in the shop (she is a member of the local band, S.S.T.). One of her dreams is to start an art co-op in Port Angeles. “It’s the perfect spot for being an artist,” she says. This summer, she and some of her welding classmates are hoping to find some space to rent so they can continue to work on welded art projects. “Welding is often considered just a blue collar trade, but I see it as a powerful tool in both creating art and creating sustainability because fabrication skills can be used to create anything one wants or needs! With all the talent and creativity Peninsula College has in its welding program, the possibilities are endless!" Eulalia has come a long way from the young woman who arrived in Port Angeles a year ago with just a backpack, her dog and her banjo. Now she has an apartment, is working on her degree, and discovering a whole new side of herself, things she wouldn’t be doing without Peninsula College. In fact, she now plans on enrolling in Peninsula College’s BAS degree program once she has her AAS degree so she will be prepared to start her own business when she graduates.